Six Midwestern cities are among 22 communities nationwide that were commended on Monday for taking innovative approaches to streamlining solar development. Their actions were aimed at reducing the “soft costs” of solar installation – the costs outside the actual hardware – and are estimated by the federal Department of Energy to comprise about two-thirds of the price of a solar installation . . . 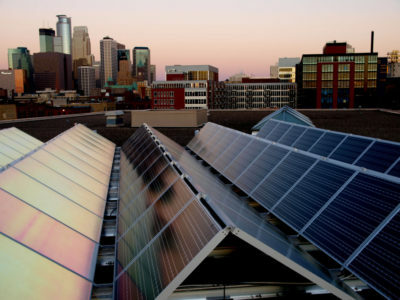 Although federal and state governments generally take the spotlight for offering tax breaks and other incentives aimed at fostering solar, “cities can do a lot about soft costs,” said Gayle Prest, Minneapolis’ sustainability director. Click to read more. This entry was posted in NewsBlog and tagged Business Wire, GreenBiz, Karen Uhlenhuth, Michigan Live, Midwest Energy News, Midwestern cities innovative solar-friendly policies, MIT Technology Review, NET Nebraska, reducing solar energy's soft costs, Solar Energy Industries Association (SEIA), U.S. Department of Energy's SunShot Initiative, Winona Daily News on September 27, 2016 by Helen Deffenbacher. COLUMBIA — Columbia is set to be one of the first communities in the nation to join a program that seeks to reduce the cost of soaking up solar energy. SolSmart, a $13 million investment by the Department of Energy that is run by The Solar Foundation, will assist Columbia in cutting costs associated with installing solar panels. Continue reading. SolSmart is a national recognition and a no-cost technical assistance program for local governments designed to drive greater solar deployment and reduce costs. To learn more, click here. This entry was posted in Nebraska / Midwest News, NewsBlog and tagged Columbia Missourian, reducing solar energy's soft costs, SolSmart, The Solar Foundation on May 24, 2016 by Helen Deffenbacher.